We are pleased to report increasing levels of work for our window sampler rig (pictured). This compact tracked window sampler is small enough to fit through a standard domestic doorway, meaning that tight spaces and situations with difficult access can be dealt with, enabling us to complete deep sampling for either geotechnical or environmental purposes. 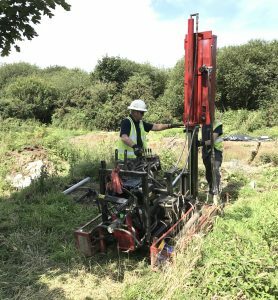 The window sampling rig can undertake geotechnical testing by either Standard Penetration Test (SPT) or dynamic probe methods where required for assessing ground conditions.